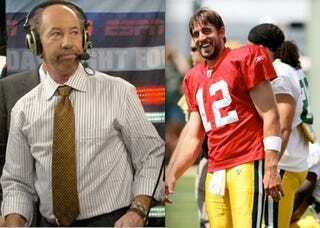 Not only did the Packers QB call TK terrible, unfunny, and clueless, but he did it on ESPN Radio. This is not what the WWL had in mind when they consolidated their media empire. Rodgers was on ESPN Radio Milwaukee, and thankfully, Sports Radio Interviews was there to transcribe. You know who was better than Tony Kornheiser? Dennis Miller was ten times better. Dennis Miller was a great comedian, but one of the worst Monday Night Football guys ever. And he was ten times better than Tony Kornheiser. His stuff was actually funny. Tony stuff wasn't funny at all. He did no research. We'd sit in those production meetings and he would add absolutely nothing to the conversation. I'd be like, ‘What are we doing here? This is stupid. '… You get in there with Tony and he's asking you all these dumb questions that have no application to the game you are playing or anything you are doing. He's terrible… I don't think he's funny. I don't think he's insightful. I don't think knows anything about sports." Rodgers also thinks Ron Jaworski dicked him over on draft day, Marcellus Wiley doesn't know what he's talking about, and Trent Dilfer is actually a good analyst. So, you know, grain of salt.